This section covers the assembly of the Elegoo Robot Car V2.0. This is a cheap and simple autonomous vehicle starter kit. The standard kit includes software modules and sensors for obstacle avoidance, line tracing, IR, Bluetooth, sonar, with an Arduino for processing. This kit will serve as the hardware foundation for subsequent projects focusing on software development. The Arduino Uno board is a microcontroller that is essentially a simple computer optimized to run a single program over and over. The Arduino is great for hardware products since it is ideally suited to interface with analog and digital sensors, servos, and actuators. The Arduino language is similar to C/C++ and is good for those new to programming. Arduinos run off of software files called “Sketches.” While you can wire devices directly to the pins on the Arduino, there is an extensive set of “shields” which are expansion boards developed which make it easier to connect hardware devices to the Arduino. The Elegoo kit comes with a sensor board that makes it easier to plug all of the different sensors. On the software side, the Arduino community has a large number of libraries developed by the community which can easily be incorporated into an Arduino Sketch to improve its functionality. The Elegoo kit comes with a CD which includes detailed assembly instructions as well as sample code and documentation. I won’t recreate the provided tutorial since it is comprehensive and detail but I’ve included a few images here of the construction for reference. As evident in the image below, the kit comes well package and organized with a chart identifying all the parts and tools that come in the kit. 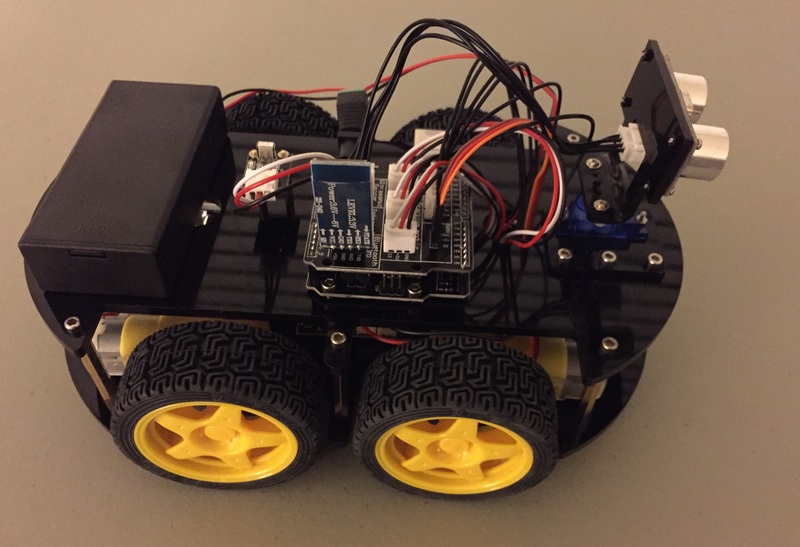 The vehicle has a base plat for attaching the wheels and motors as well as a top plate for the Arduino and sensor shield. The motors are all connected to a power distribution board as shown below. The line follower modules are installed on the bottom of this base plate as well. The top plate contains the Arduino with the sensor board mounted. It also has space to install the battery case. The sonar is mounted up front attached to a servo. The line following modules and motor control cables are routed from the bottom base plate through a hole in the upper base pate and connected to the sensor shield. Once everything is wired up, the vehicle looks like the image below. The last step is to install the wheels on the motor shafts. The fully assembled vehicle is shown in the image below.